We had two very cold and wet days and I feel bad for the birds that just arrived here a week ago. 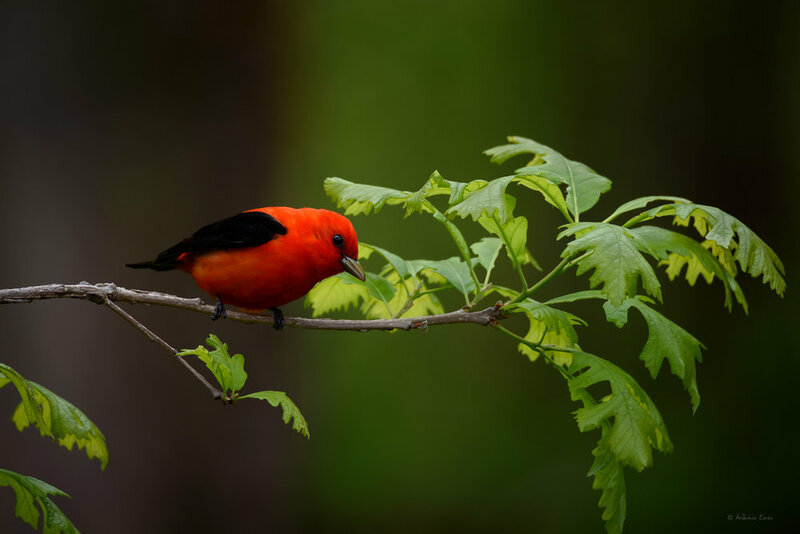 The Scarlet Tanager spends the winter in the tropical forest of northwestern South America. During the last years we always had a pair or two here during the summer but it is a very secretive bird and we usually see it only in May or June. I don’t know if it is the cold weather only, but right now we see up to six male and three female tanagers in the “front and back yard studio”. They use our suet feeders or eat from the oranges we put out for the orioles very frequently and this gives me a lot opportunities to make a click while they are waiting for their turn in our trees and bushes. We can only imagine how hard it is for the birds after such a long journey to replenish their energy and the cold temperatures (yesterday it was 46ºF / 8ºC) are not helpful for sure. The brilliant colors of both sexes make it very inviting to take their pictures. The dark overcast we had most of the time requires shooting with relatively long exposure and not every click leads to a sharp photo. Wind and the movement of the birds play a role as well. I shoot the SIGMA 150-600 wide open at f/6.3, 600 mm, and ISO set between 200 and 400 at the most. The exposure time was mostly between 1/60s and 1/200s but there were a few shots as far down as 1/25s.